And so on to viscosity. Lewis Fry Richardson, 1881 – 1953. English mathematician, physicist, meteorologist, psychologist & poet. 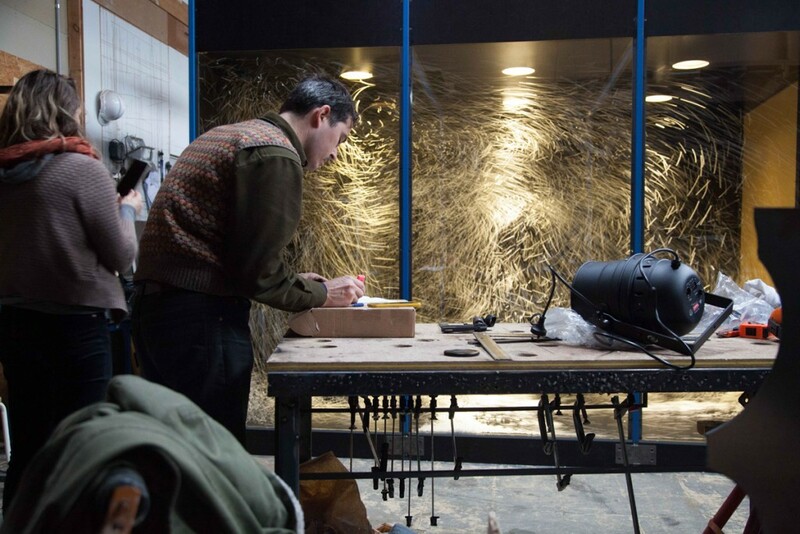 Part scientific-model, part black-box theatre, A Hierarchy of Eddies is an art-science experiment in staging the phenomenon of turbulence. 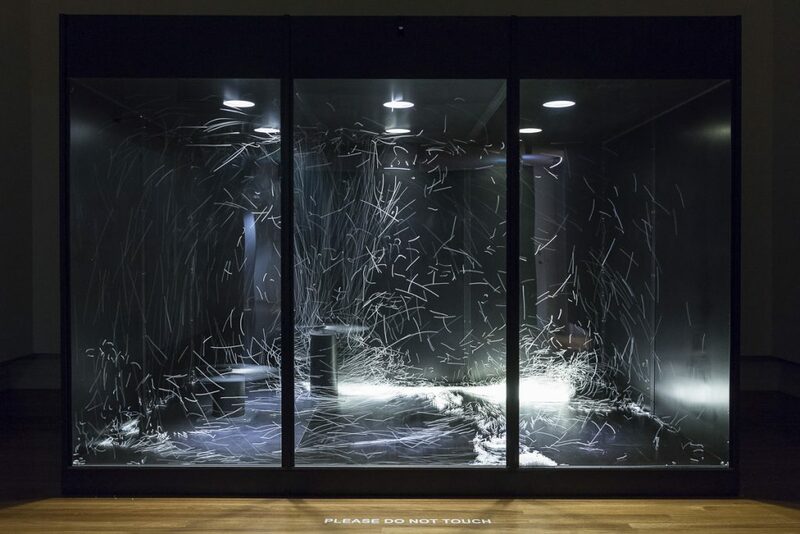 Comprising two axial fans and ten litres of polystyrene balls inside an enclosed chamber, this kinetic work enacts a constantly changing system, analogous to fluid flows everywhere; from inside our bloodstream, to rivers, tornadoes, rising smoke from a cigarette or cyclones on the surface of Jupiter. Framed by a proscenium, the moving balls act like pixels, constantly drawing the currents of air as they circulate around the chamber. Their actions reveal how higher levels of energy within the large scale swirling structures, cascade into smaller and smaller scale structures. This dissipation of energy creates what is known as ‘a hierarchy of eddies’. A hallmark of turbulence, eddies (also known as vortices or whorls) can form in unpredictable ways, so much so that turbulence is considered one of the greatest mysteries of science. A Hierarchy of Eddies invites a viewer to keep pace with these mesmerising patterns as they form, collapse and reform; a cycle of cycles further amplified by intermittent strobe light. And while it is possible to quantify many of the dynamic forces at work inside this microcosm, many may prefer to simply witness the dramatic interplay unfold. 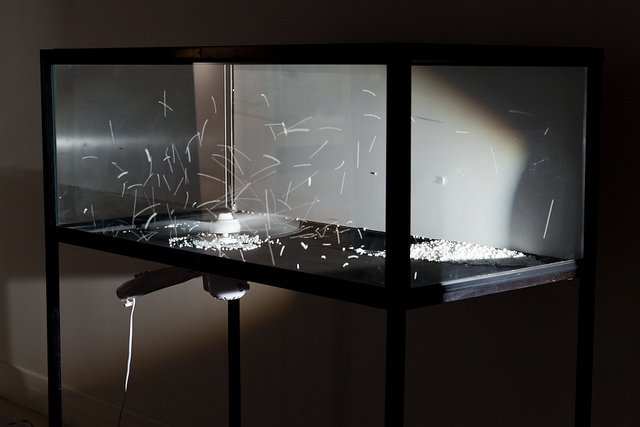 A Hierarchy of Eddies (sometimes known as the Particle Chamber) was commissioned by Experimenta Makes Sense: International Triennial of Media Art 2017 – 2020 and was funded by a grant from The City of Melbourne. Experimenta Make Sense was featured as part of the Melbourne Festival’s 2017 Visual Arts Program. SFN collaborated with many skilled people to realise this work. Scientific consultants: Prof Andrew Melatos, Prof Andrew Ooi and Tony Zahtila. And fabricators/artists: Simone Tops, Brian Scales, Hue Smith, Pierre Proske and Kathy Holowko. Our sincere thanks also go to Jonathan Parsons, Susan Kukucka and Nicky Pastore from Experimenta. Photos in the set above are by Zaylee Saint James Turner, Mark Ashkanasy and Briony Barr. For a look behind the scenes…take a scroll through this set of images. Video documentation by Sam Mcgilp here. And finally, below is a short essay about the work by our collaborator, Andrew Melatos. The Particle Chamber is an experiment in provocation. 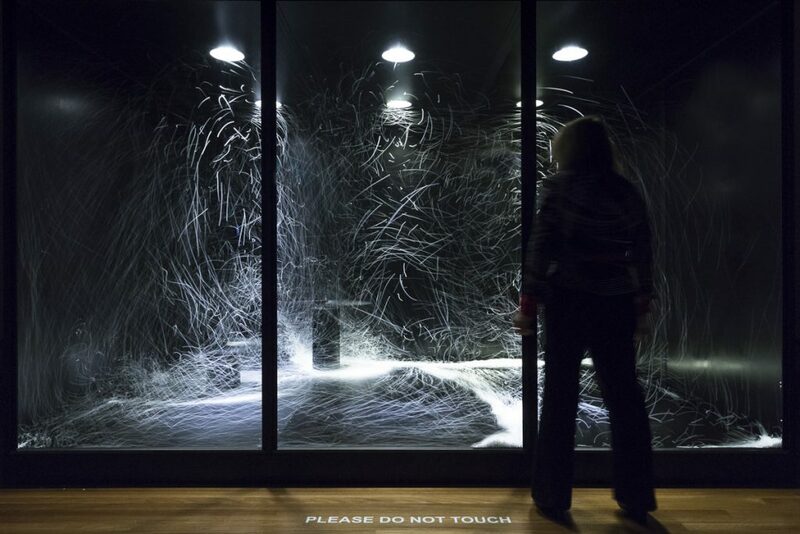 Artfully and paradoxically, it invites the viewer to respond to the sight and sound of turbulence in rapidly flowing air by searching for visible and audible patterns in the flow. Where chaos is anticipated, order emerges. It is natural for the viewer to approach the work encumbered by a preconception of turbulence as randomness. The work subverts this aesthetic intuition. The eye is drawn irresistibly to the undulating, strobe-lit motions of Styrofoam beads surfing an elevated stream of air or “chasing their tails” around a miniature tornado near the floor. The ear is drawn to the steady hum of the fans punctuated by the “popcorn noise” of beads spattering the fan blades and Perspex enclosure. There is something choreographed about the scene, yet the choreography is not of the designer’s making. It reflects the internal, two-sided logic of the system: the turbulent flow, with its intrinsic tendency towards oscillation and vorticity, and the viewer, engaging intimately with the flow, impelled by the universal human instinct to discern patterns. 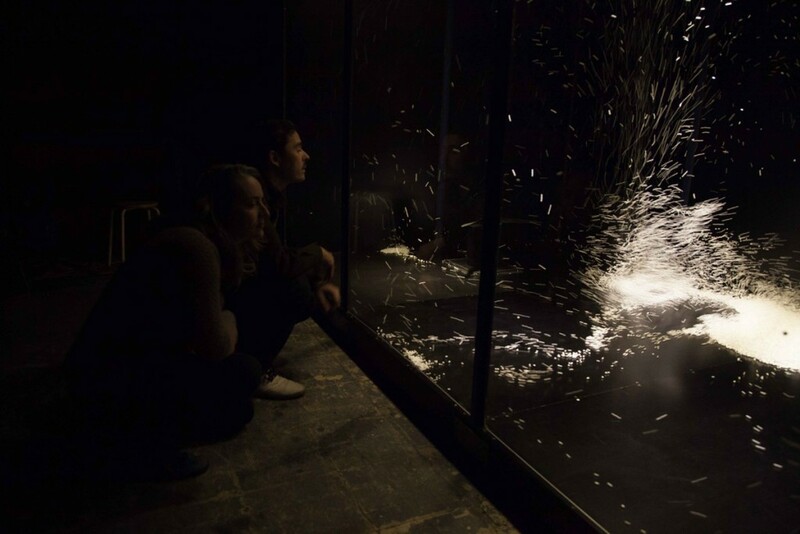 The particle chamber is both artefact and performance. Its medium is air. Its motive forces are pressure and viscosity. Temperature and humidity are key factors. Imagine repeating the experiment in a tank of water. Would anything be different? What about a tank of honey or motor oil? 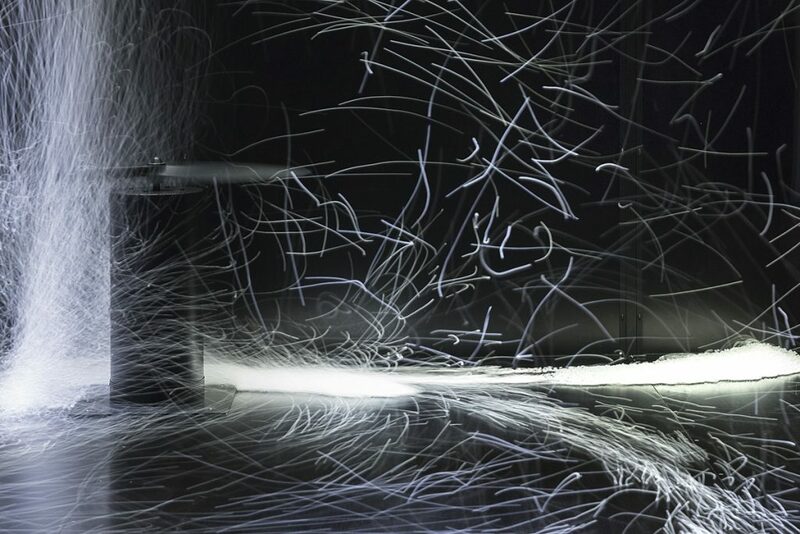 At any strobe-lit instant, the work is a frozen object – a portrait – a kinetic sculpture of air in motion. The air’s viscosity determines the “texture” of the turbulence – the degree to which the air streams are laminar or tangled, the ease with which they mix and dissipate – just like the viscosity of paint affects the texture of a canvas. The fans resemble outsized brushes, whose sweeping strokes imprint eddies on the flow. But the metaphor of the chamber as artefact is incomplete. The work is dynamic and unpredictable. Framed by its container and lit by the strobe, it also presents itself to the viewer as an experiment in drama. The beads trace the flow passively, but the air itself – the lead protagonist – is alive and expressive and capable of response. Through viscosity and nonlinear forces, the air translates the pressure produced by the fans into complex, turbulent eddies at all length-scales, from the small to the large.1 It reacts to an external script but interprets the script in unpredictable ways, exploring dramatic possibilities within the contours set by the fans. In this respect, the particle chamber is both theatrical performance and archetypal out-of-equilibrium system. It organizes itself internally through the creation and destruction of complex patterns – emergent forms – to accommodate the demands of driving forces and boundary conditions. Both as artefact and as performance, the particle chamber relies on the viewer’s complicity to fulfil its artistic purpose. It serves up a tableau of complex, dynamic events, but it is the viewer’s eyes, ears, psychology, and aesthetic sensibility which assemble the events into a narrative, a meaningful sequence of visible and audible patterns. Each viewer’s experience of the tableau is unique. In this way the work blurs the distinction between artistic representation and scientific emulation. It provokes the viewer to do their own, personal, irreproducible experiment into the mysteries of far-from-equilibrium pattern formation. It opens the door between studio and laboratory and encourages free passage.